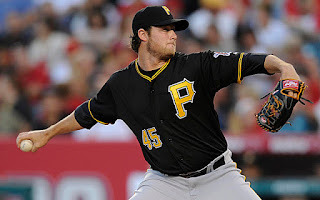 Pittsburgh Pirates ace Gerrit Cole is in the crosshairs of the New York Yankees, according to Jon Heyman of FanRag Sports. The team that added the National League MVP Giancarlo Stanton over the weekend, is hoping to increase their talent on the mound as well with Cole being a potential major arm in the starting rotation. Cole did not have a dominant 2017, pitching to a 12-12 record and a 4.26 ERA. He did top 200 IP and struck out 196 batters over the course of the season. The best part is that he is 27-years-old and could be a major piece in the rotation for years to come as he is controlled through the 2019 season, should he regain the level of play he had in years prior. For that reason the asking price may be more reasonable from the Yankees than if he performed to his usual form. Between six starters the Yankees pulled down a respectable 3.72 team ERA with only two pitchers above a 4.0. The unsure situation around CC Sabathia could force New York's hand even more and keeping his innings more manageable is possible considering the deep bullpen. Cole may not be asked to do as much heavy lifting in the Bronx as he was asked to do in PNC Park. It's too early to tell who the Yankees would look to trade in exchange for Cole, though there is some speculation that the Yankees would be willing to move Clint Frazier, who appears to be the odd man out with the Yankees current logjam in the outfield. In addition to Frazier, the Yankees have the depth to get this done, and Yankees GM Brian Cashman has proven he is more than capable of striking bargain deals. The Yankees are not the only team looking to boost their starting rotation during the winter meetings. The Minnesota Twins, who had a resurgent 2017 before falling to the Yankees in the Wild Card game, are also interested in the right-hander. Considering he has two more years left on his contract, the Twins may be super aggressive in their approach. A budget team at times, Minnesota could become a contender with Cole, forcing the Yankees to potentially offer more of an enticing package.